Sheffield United have made their first signing for next season! The Sheffield office of international legal firm Kennedys has extended its current three year deal for the sponsorship of The Kop stand at the League One club’s Bramall Lane stadium by a further three years until 2016. Kennedys, the legal service provider for the Blades and owner Kevin McCabe’s Scarborough Group International, is a specialist national and international law firm with unrivalled expertise in litigation and dispute resolution. Its flagship Sheffield office opened in July 2010 and is now one of the second largest in the firm’s global network providing a substantial regional, national and international client base mainly within the insurance, commercial, construction, retail, engineering and public sectors. Suzanne Liversidge, Managing Partner of the company’s Sheffield offices based at the Electric Works, Sheffield city centre, said: We are delighted to have agreed our continued sponsorship of The Kop for the next three years. Kennedys are proud to be associated with the Blades and its supporters. We are looking forward to building on our relationship with the club in the future and, hopefully, there will be a promotion or two to celebrate along the way. Sheffield United plc chairman Kevin McCabe said: We are delighted to have the strategic partnership with Suzanne and the excellent team at Kennedys. I would like to thank Kennedys for their continuing support which, with this extension, will stretch to six years, an indication of the strength of the relationship we enjoy with our commercial partners. 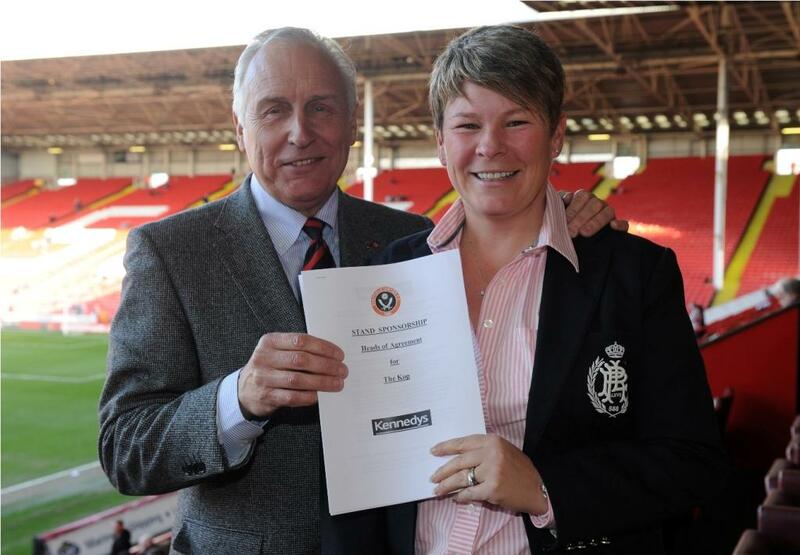 Sheffield United plc chairman Kevin McCabe and Suzanne Liversidge, Managing Partner, Kennedys Sheffield office. Yorkshire specialist car dealership Lawton Brook offers motoring enthusiasts chance to own McLaren GT3!